November may seem like a funny month for travel. With Thanksgiving, Christmas and New Years around the corner, some would choose to stay put. Smart travelers know, however, that November is one of the best months to snag great travel deals, see beautiful fall foliage and partake in great fall festivals. There is no better place to snuggle into some fall travel than Eureka Springs , Arkansas. The first week of November is typically Peak Week for Fall Foliage. The very hills in and around Eureka Springs becomes a patchwork of beautiful fall colors. There is not a more perfect spot in the Ozarks to see fall foliage! November 10-13 is the Eureka Springs Food & Wine Festival. Come experience the culinary excellence that Eureka Springs is known for. Many Eureka Springs Restaurants will be featuring their chef’s signature courses expertly paired with perfect wines. November 18-20 at the Inn of the Ozarks Convention Center. This annual fall antique show is one of the largest antique festivals in the Ozarks. Quality antiques, collectibles, toys, jewelry, primitives and so much more brought to you by dealers from across the Midwest. Pottery and doll restoration on-site by Sublime Antique Restorations from Dallas. For a complete list of lodging in Eureka Springs, please visit EurekaSprings.com. 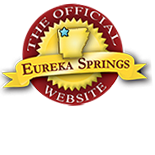 Don’t miss our Calendar of Events for the latest events in the Eureka Springs area! This entry was posted on October 26, 2016 by service424 in Attractions, Family Fun, Festivals, Fun Downtown, Things to Do, Weekday Getaway. 4 quirky roadside attractions….3 epic adventures… 2 days (or more)…in 1 great town.